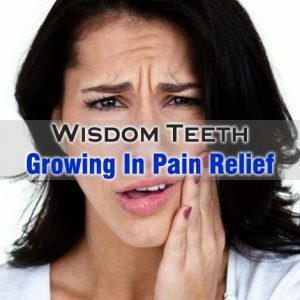 Every one of us experience pain when wisdom tooth erupts. Wisdom teeth are the four final teeth that erupt. They are the last and third molar teeth that erupt on either sides of lower and upper jaw. Generally, these wisdom teeth erupt between 17 to 21 years of age. And most of the adults grow four wisdom teeth. But, in some people few wisdom teeth erupt. Erupting of wisdom teeth generally involves tenderness in gums, toothache, and pain. When the wisdom tooth erupts partially makes it exposed to bacteria. This results into pain, swelling, and stiffness of jaws. Instead of medications, there are certain home remedies that can help you with wisdom teeth growing in pain relief. But, when wisdom teeth grow incorrectly, it can result into persistent pain. In such cases, it is best to talk a dentist and get it removed. One of the best things you can do for relief from wisdom teeth growing in pain is rising with salt water. All you need to cup of warm water and a teaspoon of salt. Mix salt in warm water by stirring well. Rinse your mouth well for about 30 to 60 seconds. You can repeat it throughout the necessary if needed for pain relief. Clove is another effective home remedy for wisdom teeth growing in pain relief. You need to place a clove on wisdom tooth until the pain goes away. Make sure that you do not chew the clove during this process. You can also use clove oil for wisdom tooth pain relief. You need to take few drops of clove oil on your finger and rub it gently on the affected area. Garlic is another wonder natural ingredient that works effectively in wisdom teeth pain relief. Garlic works as a natural antibiotic, anti-inflammatory and antioxidant. For pain relief, you just need to slightly crush a garlic clove and hold it at the affected area. Alternatively, chewing of garlic cloves is also helpful in pain relief. Peppermint is another effective natural remedy for wisdom teeth growing in pain relief, which is been used for ages. Along with pain relief, it also helps in killing bacteria. For pain relief, you just need to rub the affected area with peppermint oil. Alternatively, you can rinse your mouth with mixture of cup of hot water and a teaspoon of dried peppermint leaves for 30 to 60 seconds. Onion is also one of the effective home remedies for wisdom tooth pain. For wisdom tooth pain relief, you just need to cut a piece of onion and place it inside the cheek at the affected area. Hold it like that as long as you can hold for about 10 to 15 minutes.